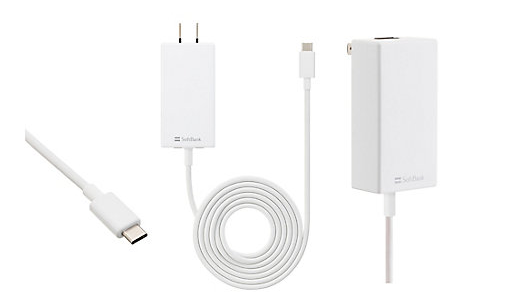 Alternative chargers like the 27W based Softbank SELECTION USB PD USB Type-C Rapid Charging AC Adapter (2018) can be used to charge a variety of phones including the Google Pixel 3 XL using USB Power Delivery technology. Upon connecting the Google Pixel 3 XL to the Softbank SELECTION USB PD USB Type-C Rapid Charging AC Adapter (2018) over USB Type-C, we could see at initial voltage of about 5 volts almost no current was pulled by the phone. It took about 1 second for the voltage to rise up to a 8.8 volts rail where the phone finally pulled current which quickly ramped up to enable charging at around 20.2 watts (8.8 volts @ 2.3 amps). As the current kept on changing from 2.1-2.3 amps, the phone was charging in between 18.5-20.2 watts (8.8 volts @ 2.1-2.3 amps) with the Softbank charger. Click here to download the trace captured by the GRL-A1 power analyzer to see more details. The Softbank charger managed to deliver above 18W to the Google Pixel 3 XL which is slightly more power than the phone can get from its own shipped 18W charger as observed here.